Today we tried out a different ‘tween’ – the motion tweet. 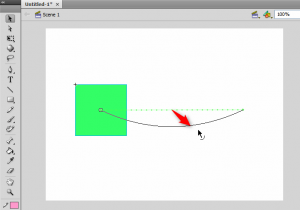 This lets your object fly along a straight or curved line. First create a circle. Then insert a keyframe further along the timeline (maybe around frame 30). Right-click on the grey part of the timeline and select Create Motion Tween. Select the first frame and drag the ball to where you want it to start. Select the last frame and drag the circle to where you want it to end. A dotted green straight line should appear. You can also bend the line in more interesting ways using the white sub-selection arrow. If you play about with dragging the handles on the green lines that are shown at the ends of the curve then you can alter the direction and angle of the curve. 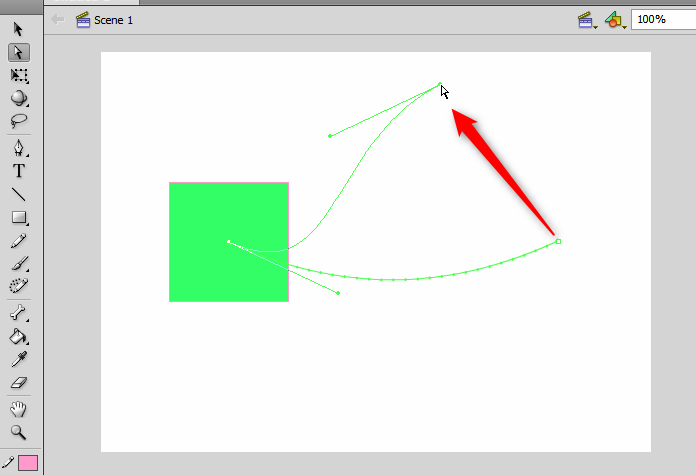 You can now preview the animation and see your object flying around the screen following your curve. This entry was posted in Adobe Flash, Animation, Ms Farrell's blog, S3 DMC, S4 DMC, S5-6 DMC. Bookmark the permalink.